In the late 1990s, the Junior League of Las Vegas needed permanent headquarters for its burgeoning membership. Combining this need with its mission of historic preservation, the League found a historic house scheduled for demolition and decided to move it to a new location. Easy, right? Well, not exactly. This exhibit gallery, with images by Fred B. Couzens and text by Carole Cosgrove Terry, takes you through a brief history of the project and the challenges the League had to conquer to finally end up with a house to save. 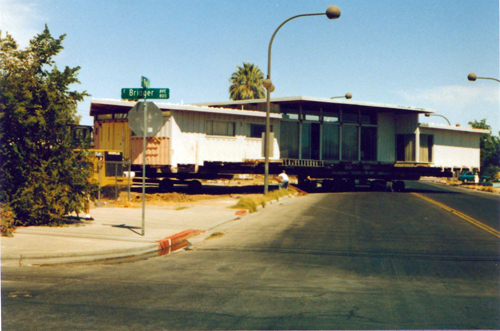 Accompanied by images of the early-morning relocation of the Morelli House, this story is truly a miracle of Mid-Century Modern conservation. 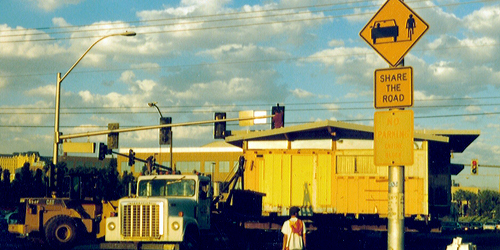 Photograph courtesy of Fred B. Couzens. 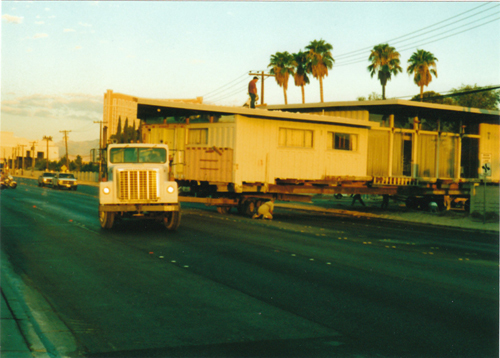 The Morelli House navigates morning traffic as it moves down Paradise Road and Twain Avenue in Las Vegas in 2001. 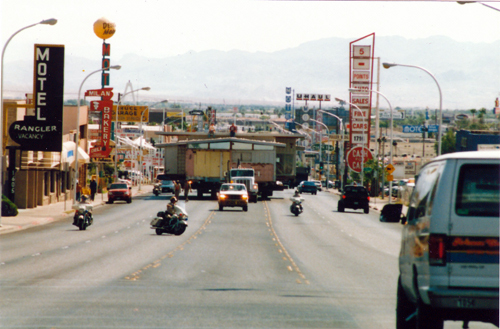 By the 1990s, the Junior League had grown large enough that it needed a permanent headquarters in Las Vegas. Since historic preservation is a priority of its members, the League searched for a building appropriate both for restoration and to serve as its headquarters. Upon learning that the historic mission-revival-style Whitehead House was scheduled for demolition in 1997, the League agreed immediately to move the House. Photograph by Fred B. Couzens, courtesy of the Morelli Collection, Special Collections Department, University of Nevada, Las Vegas. 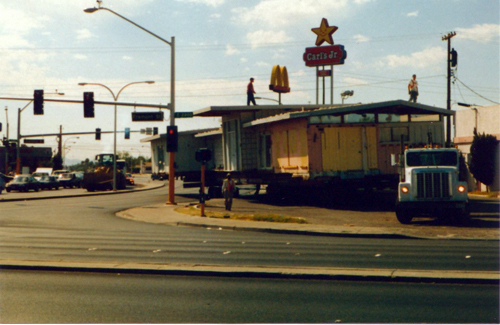 The League had not yet purchased a piece of property for the Whitehead House, so the house was relocated to vacant land loaned by Jackie Gaughan, owner of the El Cortez Hotel and Casino, where it stayed until the funds were raised to buy the land. 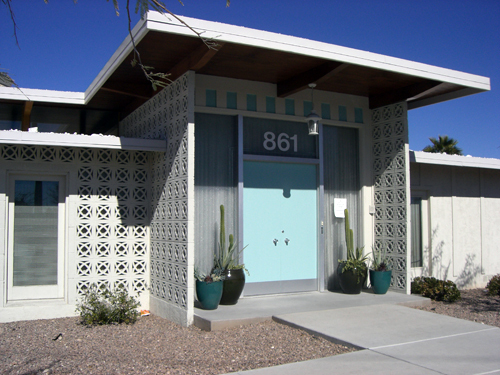 Thanks to funding from the Nevada Commission on Cultural Affairs, a site was purchased on Bridger Avenue. 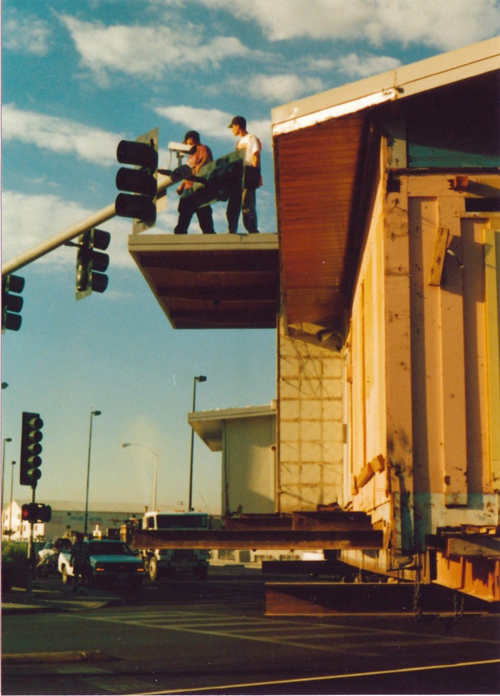 Tragically, on July 25, 2000, only a few days before the Whitehead House was to be moved, vandals gained access to the property and burned it to the ground. But this was just a new beginning. An expensive, expansive soil problem delayed the completion of the House’s foundation until May 2, 2002. A funding drive and in-kind contributions allowed the League to continue its restoration to obtain a “Certificate of Occupancy,” complying with the standards set by the U.S. Secretary of the Interior. The League moved into its new, permanent headquarters in December 2003. Restoration continued. Thanks to additional grants from the Nevada Commission for Cultural Affairs and other generous donors, the House was prepared for its public “debut” by the winter of 2006. Internationally famous Mid-Century Modern furniture designer Vladimir Kagan was instrumental in providing magnificent period-accurate furnishings. On April 9, 2007, the Junior League opened the Morelli House to the public for tours. Front of the Morelli House.